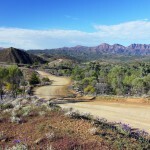 If you ever decide to take a drive along the Cunningham Highway in southeast Queensland, whether it be travelling from Warwick to Brisbane or vice versa, there is an obstacle that must be negotiated along the way. Approximately 50 kilometers northeast of Warwick, forest-clad mountains rise sharply above the surrounding farmland and there is only one place where you can pass through them. The crossing point is called Cunningham’s Gap and it bisects the delightful Main Range National Park. 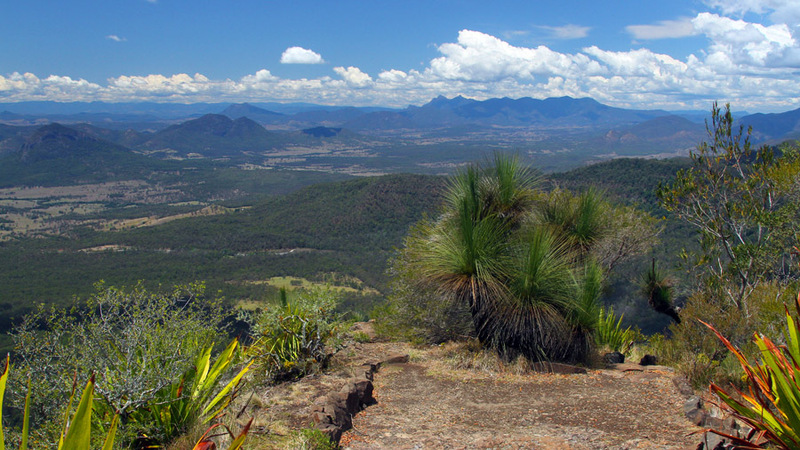 Main Range National Park is part of a mountain chain that straddles the eastern part of the Queensland – New South Wales border. 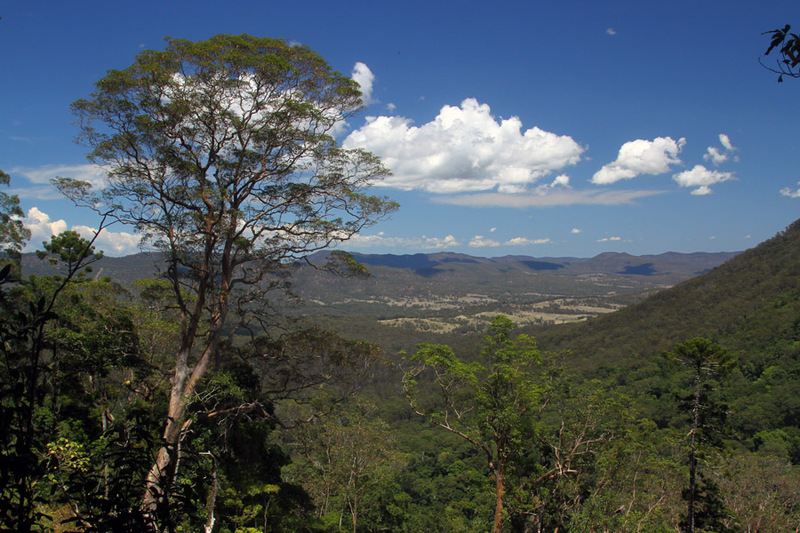 There are a number of other conservation areas along this range, such as Mount Barney National Park, Border Ranges National Park, Lamington National Park and Springbrook National Park, and together these form part of the Gondwana Rainforests of Australia World Heritage Area, a large tract of protected sub-tropical rainforest. The view south from the slopes of Mt Cordeaux. In October, 2015, I went on an 18-day road trip from Melbourne to Queensland’s Sunshine Coast and back again, and four of those days were spent in Stanthorpe, a town located 40 kilometers north of the Queensland-New South Wales border in the heart of the Granite Belt. Most of my time there was spent exploring Girraween National Park (see my other posts Nature’s Jewellery Box and Gotta Love Girraween! ), but I decided to set aside a day to go for a wander in Main Range National Park. It only takes about an hour and twenty minutes to drive from Stanthorpe to Cunningham’s Gap and when you reach the gap, there is a carpark right next to the highway. On the carpark side of the road is a walking track that leads to Mt Cordeaux. On the opposite side of the highway is a track that winds its way up to Mt Mitchell. I chose the Mt Cordeaux track this time. This is a 6.8km return trip and the guides say it takes around 2.5 hours to complete, so I made sure I gave myself plenty of time because I usually at least double the suggested time due to my insect-hunting pace. As it turned out, I spent a little over five hours exploring this fascinating place. 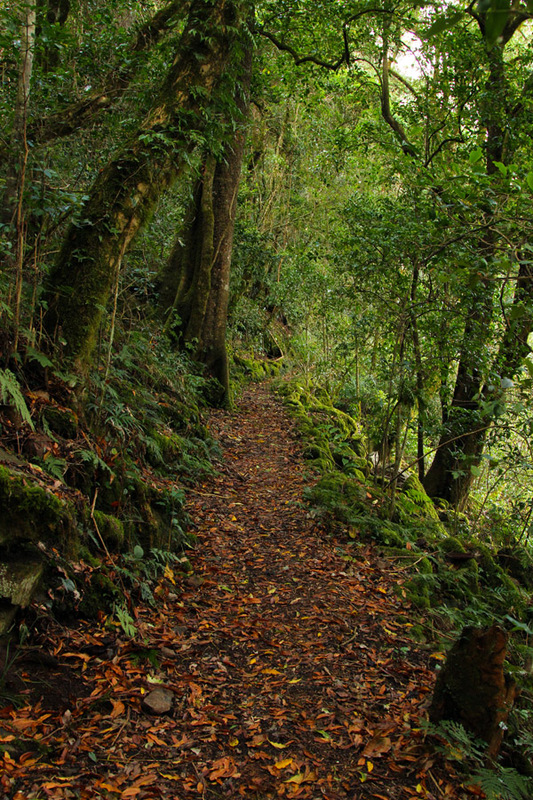 Part of the track that passes through the moss-laden rainforest. After leaving the carpark, the track immediately plunges into the lush sub-tropical rainforest, which at first glance appears lifeless apart from the vegetation, but gradually reveals its secrets. Birds are often heard without being seen, and occasionally you will hear something bounding along the forest floor and you might catch a glimpse of a Pademelon, a small member of the Kangaroo and Wallaby family, as it disappears into the undergrowth. There are certainly a good number of invertebrates inhabiting the densely vegetated spots, but I found them to be more abundant where the track heads up and out of the rainforests to the more open sections near the summit of Mt Cordeaux. Here the warmth of the sun is largely unhindered and there are more flowering plants, so the insects and spiders have all they need to fuel their fast-paced lives. 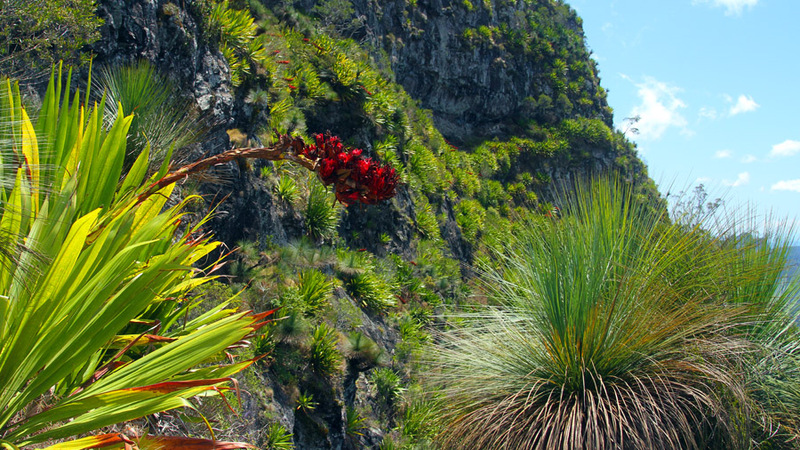 The steep, rocky slopes of Mt Cordeaux and the ridge that follows the escarpment north to Bare Rock and beyond are covered in small to medium sized trees, shrubs and grasses, and some areas are dominated by Grass Trees (Xanthorrhoea species) and the impressive Giant Spear Lily (Doryanthes palmeri), with its mass of red flowers on the end of a long stalk that droops under the weight. I spent most of my time searching in and around the Grass Trees and lilies, with mixed results. As is always the case, there were one or two insects that managed to elude my camera, but I did manage to come up with a few interesting finds. Blooms with a view. Giant Spear Lilies cling to the sheer face of Mt Cordeaux. 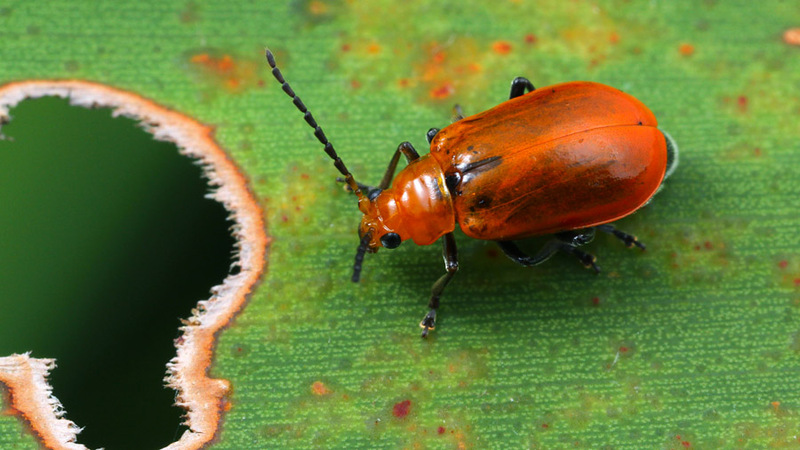 A small leaf beetle from the subfamily Galerucinae seems to be considering how to negotiate the hole in the leaf. 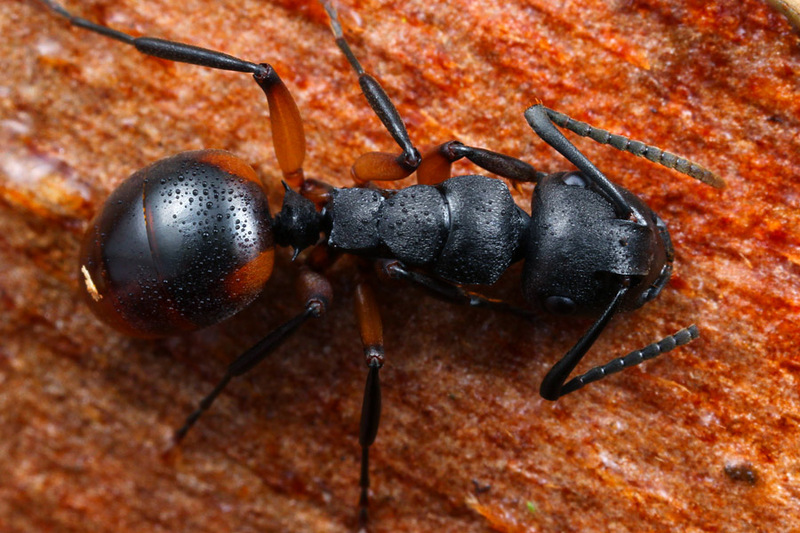 Polyrhachis (Campomyrma) femorata (subfamily Formicinae), one of the rainforest-dwelling species of ants. 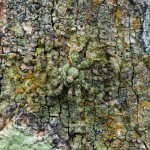 An unidentified Jumping Spider, which may belong to a new genus, makes its home in the Grass Trees that grow in the elevated areas of the park. 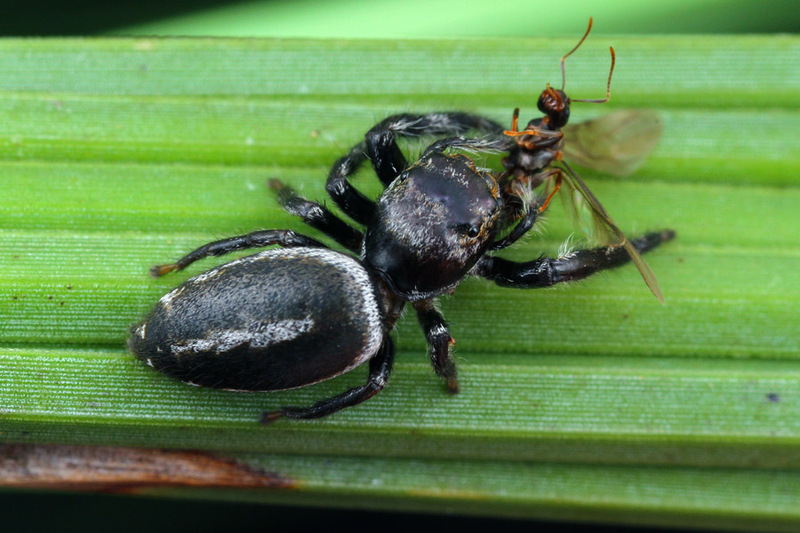 There is always a ready supply of food, like this winged ant. 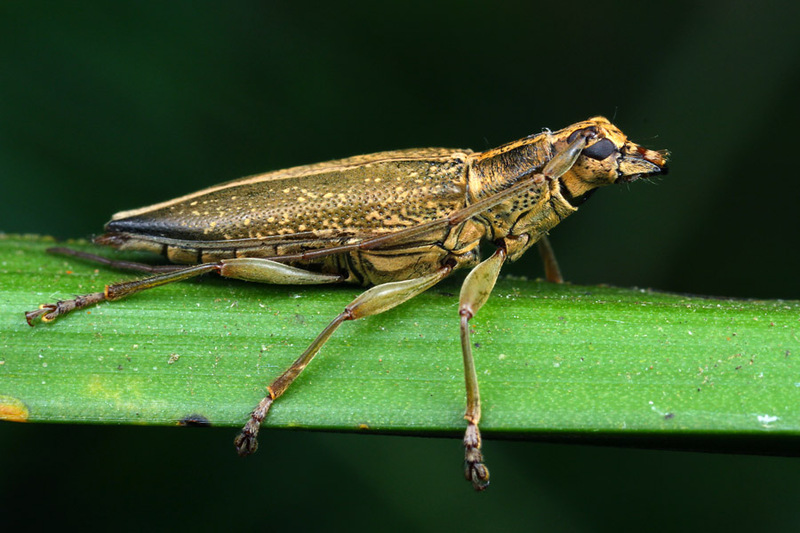 There are a couple of species of Temnosternus (family Cerambycidae, subfamily Lamiinae) that inhabit the park and feed on the leaves of the Giant Spear Lilies. 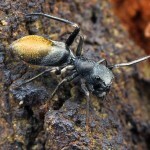 T. planiusculus is the most common. 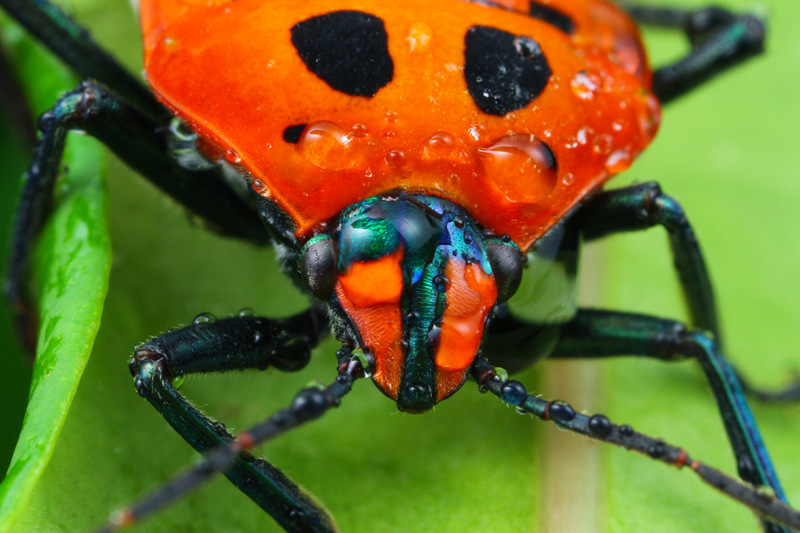 A large colourful bug called Cantao parentum (family Scutelleridae) has been caught in a mid-afternoon shower. I got caught in the same shower, but fortunately it was near the end of the walk, so no harm done. If you have any questions or comments about this post, please send me an email via the CONTACT PAGE.